ZM39923 is an JAK1/3 inhibitor with pIC50 of 4.4/7.1, almost no activity to JAK2 and modestly potent to EGFR; also found to be sensitive to transglutaminase. Cercosporamide, an usnic amide, was originally identified in Cercosporidium henningsii as a host-selective phytotoxin and broad-spectrum antifungal agent and is a potent inhibitor of MAP-kinase interacting kinase-2 (Mnk2; IC50 = 11 nM), JAK3 (IC50 = 31), and Mnk1 (IC50 = 116 nM). 1,2,3,4,5,6-Hexabromocyclohexane is a potent and specific inhibitor of JAK2 autophosphorylation. Janex-1 is a cell-permeable, reversible, potent, ATP-competitive, and specific inhibitor of JAK3 (IC50 = 78 uM); has no effect on JAK1, JAK2, or Zap/Syk or SRC tyrosine kinases. CYT387 sulfate salt is an ATP-competitive inhibitor of JAK1/JAK2 with IC50 of 11 nM/18 nM, ~10-fold selectivity versus JAK3. S-Ruxolitinib is the chirality of INCB018424, is a potent and selective small-molecule Janus kinase 1 (JAK1) and JAK2 inhibitor. Decernotinib is an oral, selective Janus kinase 3 (JAK3) inhibitor being developed by Vertex. Solcitinib is a Janus kinase 1 (JAK1) inhibitor. INCB39110 is a potent JAK1 tyrosine kinase inhibitor, which is currently in Phase II trials for the treatment of rheumatoid arthritis, myelofibrosis, rheumatoid arthritis and plaque psoriasis. Filgotinib is a selective JAK1 inhibitor with IC50 of 10 nM, 28 nM, 810 nM, and 116 nM for JAK1, JAK2, JAK3, and TYK2, respectively. Cucurbitacin I, Cucumis sativus L. has been found to suppress levels of phosphotyrosine Stat3 (signal transducer and activator of transcription 3) in v-Src-transformed NIH 3T3 cells. NS-018 maleate is an ATP-competitive small-molecule inhibitor of JAK2 with IC50 of 470nM in Ba/F3-JAK2V617F cells . have30-50-fold greater selectivity for JAK2 over other JAK-family kinases, such as JAK1, JAK3 and tyrosine kinase 2. NS-018 hydrochloride is a novel highly selective JAK2 inhibitor. NS-018 is an orally bioavailable, small molecule inhibitor of Janus-associated kinase 2 (JAK2) and Src-family kinases, with potential antineoplastic activity. WHI-P97 is a rationally designed potent inhibitor of JAK-3. FLLL32 is a potent JAK2/STAT3 inhibitor with IC50 of <5 uM. Peficitinib is a novel potent JAK inhibitor, which demonstrated potent efficacy in adjuvant-induced arthritis model in rats. Baricitinib phosphate is a selective JAK1 and JAK2 inhibitor with IC50 of 5.9 nM and 5.7 nM, ~70 and ~10-fold selective versus JAK3 and Tyk2, no inhibition to c-Met and Chk2. NSC 33994 is novel inhibitor of JAK2 tyrosine kinase (Janus kinase 2 ). Janus kinase 2 (JAK2) plays a crucial role in the pathomechanism of myeloproliferative disorders and hematological malignancies. JAK3 Inhibitor V is a potent, selective inhibitor of JAK3 (Janus tyrosine kinase 3) which binds competitively to the JAK3 ATP site. TCS 21311 is a potent JAK3 inhibitor (IC50 = 8 nM). TCS 21311 is selective for JAK3 over JAK1, JAK2 and Tyk 2 (IC50 values are 1017, 2550 and 8055 nM respectively). Z3 is a novel specific inhibitor of Jak2 tyrosine kinase. PRT062070 is a novel, oral, dual spleen tyrosine kinase (Syk) and janus kinase (JAK) inhibitor. Cerdulatinib preferentially inhibited JAK1 and JAK3 dependent cytokine mediated signaling and functional responses in various cell types. AZ-960 is a potent, selective and ATP competitive JAK2 inhibitor that inhibits JAK2 kinase with a Ki of 0.45 nM in vitro and induces growth arrest and apoptosis in adult T-cell leukemia (ATL) cell. TG-101348 is an orally bioavailable, ATP-competitive and selective inhibitor of Janus-associated kinase 2 with potential antineoplastic activity. Curcumol induces apoptosis via caspases-independent mitochondrial pathway in human lung adenocarcinoma ASTC-a-1 cells. CYT387 is an inhibitor of Janus kinases JAK1 and JAK2, acting as an ATP competitor with IC50 values of 11 and 18 nM, respectively. CP-690550 (Tofacitinib citrate) is an orally available, highly selective inhibitor of the Janus kinase (JAK) family of enzymes. AG 490 is a selective inhibitor of EGF receptor tyrosine kinase (IC50 values are 2 and 13.5 μM for EGFR and ErbB2 respectively). Also inhibits JAK2 with no activity to Lck, Lyn, Btk, Syk and Src. LY2784544 is identified as being highly selective for JAK2-V617F and has advanced into human clinical trials for the treatment of several myeloproliferative disorders. AT9283 inhibits aurora kinase A and B and targets other tyrosine and serine/threonine kinases associated with myeloid cell proliferation. NVP-BSK805 is a potent and selective inhibition of polycythemia by the quinoxaline JAK2 inhibitor that potently suppressed recombinant human erythropoietin-induced polycythemia and extramedullary erythropoiesis in mice and rats. 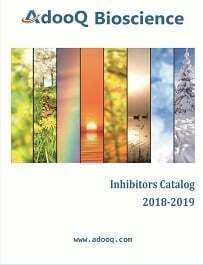 Baricitinib, also known as INCB028050 or LY3009104, is a selective orally bioavailable JAK1/JAK2 inhibitor with nanomolar potency against JAK1 (5.9 nM) and JAK2 (5.7 nM). WHI-P 154 is a JAK3 inhibitor with IC50 = 1.8uM. WHI-P 154 also Inhibits STAT1 activation, iNOS expression and NO production in macrophages in vitro. JAK Inhibitor I is a potent, reversible, cell-permeable, and ATP-competitive inhibitor of JAK1, JAK2, and JAK3. GLPG0634 is an orally-available, selective inhibitor of JAK1 (Janus kinase 1) being developed by Galapagos for the treatment of rheumatoid arthritis and potentially other inflammatory diseases. XL019 is an orally bioavailable inhibitor of Janus-associated kinase 2 (JAK2) with potential antineoplastic activity. CEP33779 is a selective JAK2 inhibitor with IC50 of 1.8 nM. BMS-911543 is an orally available small molecule targeting a subset of Janus-associated kinase (JAK) with potential antineoplastic activity. WP1066 is a novel JAK2 inhibitor and it suppresses proliferation and induces apoptosis in eythroid human cells carrying the JAK2 V617F mutation. TG-02 is a novel small molecule potent CDK/JAK2/FLT3 inhibitor.